After Marvel Comics was bequeathed Star Wars by Disney, three classic characters from the Original Trilogy received limited series as part of the new push to re-explore the Star Wars universe in comic book form. Among those three were Chewbacca and Lando Calrissian, with the former enjoying an adventure which involved helping a teenage girl save her father and others from a life of slavery and in the process, provided flashbacks and insight into Chewie’s character. The latter chose not to take the flashback route, but instead simply went back with a story for Lando set prior to his appearance on Cloud City in The Empire Strikes Back. The third character to enjoy this level of attention was none other than Leia Organa. Princess Leia is set almost immediately after the events of A New Hope and explores the emotional and practically aftermath of one’s home planet being destroyed by an Imperial super weapon. Written by Mark Waid with art by Terry Dodson, the plot is simple and straight forward. As princess of Alderaan, Leia sets out to find the surviving Aldeeraanians and a new home to preserve and save the culture and legacy of the planet. She’s joined in this endeavor with an X-wing pilot, Evaan Verlaine, also of Alderaan who should enjoy credit for inspiring Leia on the mission. 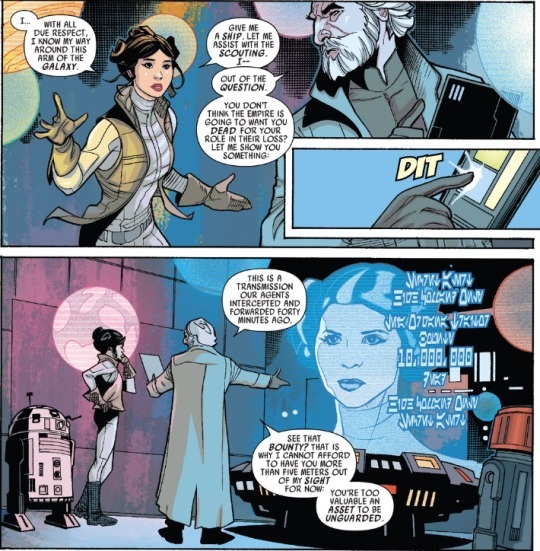 Much of the first issue is dedicated to Leia confronting the reality of the moment, trapped as a symbol of the Rebellion and wanted by the Empire forasmuch. She wants to do something useful in the fight against the Galactic Empire, but the higher ups refuse to let her out of their sights because of her value to both sides. Like Chewbacca, there are some flashbacks to Leia’s life on Alderaan, which preview a life spent learning how to be a princess in a variety of ways, be it fighting or diplomacy. These provide limited fun and make one wish for a series that might cover Leia’s past, rather than simply glimpse at it. Eventually, she encounters Evaan, who has so far mistaken Leia’s stoicism for lack of emotion over the loss of their shared planet and her father. The conversation which follows sparks Leia’s plan to find and protect her surviving people. The pair hop in a shuttle and make a successful escape from the protective, if smothering, leadership of the Rebellion. Their destination? Naboo. Princess Leia cannot escape Naboo, which courtesy of the Prequel Trilogy is actually her native planet, her mother being Queen Padme Amidala. In the limited series Shattered Empire, Leia travels to Naboo in the wake of the destruction of the Second Death Star and the defeat of the Emperor, hoping to convince the planet to join the Alliance. Once there, not only did everything go to pot, the Empire shows up to raze the planet, but also, there was a momentary hint at Leia’s own Force sensitivity. Now, in this visit, following the destruction of a Death Star, we receive another hint at Leia’s Force sensitivity when a stain glass portrait of Amidala seems to turn and look at her. 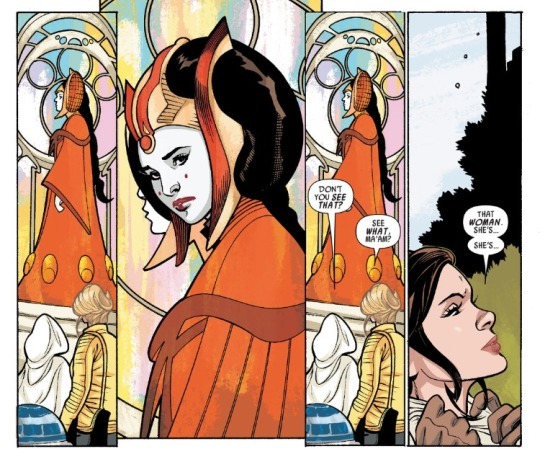 Also, like the other visit, no time is given to contemplate this hint as the plot moves forward with little care as she’s almost instantly recognized by native Naboo noble by the name of Lord Junn. Lord Junn is cut from a similar cloth as Lando Calrissian, in terms of his smooth talking and flattery. He promises to help Leia find and rescue the Alderaanian cloister band, Melodic Order. Lord Junn sends Leia to the correct venue, but also into a trap, which Evaan and Leia are able to evade. They also find the band and make an escape, trading the treasonous Junn his life for a luxury yacht to carry the band and future Alderaanians they find. Leaving Naboo behind them, the pair unfortunately do not leave betrayal with it, granted an unintentional betrayal. Among the members of the band is a singer who just happens to have a sister who wears an Imperial uniform. Naively, the singer has been relating every movement of Princess Leia and her efforts to find and protect Alderaanians, which leads the Empire to Leia’s next destination: Sullust. The home world of Nien Nunb, Lando’s co-pilot in the Battle of Endor, Sullust is also the home of a conclave of Alderaanians who partake in less than legal activities. Not at all trusting of Princess Leia, the illicit Alderaanians only accept her leadership when she coordinates the defeat of Imperial Stormtroopers sent to wipe them out. Amidst the smoking debris of the failed attack, they agree to join Leia on her growing convoy of survivors. Paranoid as they are, they uncover the transmissions from the singer going to an Imperial source. This leads to an attempt to uncover the Imperial connection, which results in the Empire quickly realizing their secret source for information has been uncovered. The Imperial sister is hauled off and destined for execution as an Alderaanian until Leia offers to exchange herself for the captive. At the same time, the survivors visit a planet where a cultural mission from Alderaan was established centuries earlier. To the horror of some of Leia’s Alderaans, their distant cousins had at some point “intermingled” with the natives and no longer looked like your run of the mill Alderaanians (they look like aliens). This disgust nearly destroys a hope of bringing these cultural Alderaanians into the fold, not to mention, the help of the locals who have their own powerful space fleet. A fleet being needed, as Leia promptly double crosses the Imperial commander, whom she agreed to exchange herself with for the singer’s sister. The commander is survived by an angry star destroyer, suddenly presented with many Alderaanian targets, as hundreds of ships full of survivors arrive to join Leia’s mission. For a moment, it appears Leia’s efforts to save Alderaan’s survivors will only result in gathering them into one helpful spot for the Empire. Leia, however, is a leader and leaders give rousing speeches, which Leia promptly does. This inspires the cultural Alderaanians to overlook the bias from earlier and raise a number of powerful ships to attack and destroy the star destroyer. The survivors, now numbering hundreds if not thousands, Leia bids them on their way to find a new home, while she returns to the Rebel Alliance, her work there still not done. 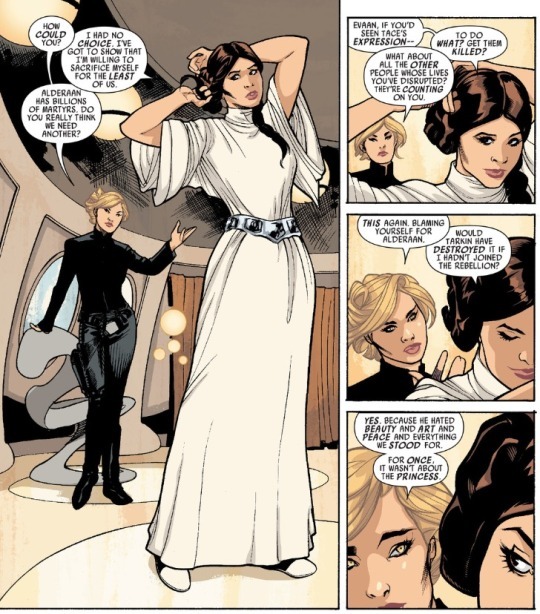 Princess Leia, written by Mark Waid with art by Terry Dodson, is a fair outing for Leia Organa, but not necessarily an exciting one. Part of the problem lies in Leia’s own representation in the Star Wars franchise as a woman who can do no wrong. A long standing, if not one hundred percent accurate, urban legend holds that Leia never misses a shot with her blaster through the Star Wars films, and the context of the limited series it feels to be the same vein. With the exception of her visit to Naboo, where she’s still successful, she’s not faulted for making any real mistakes. 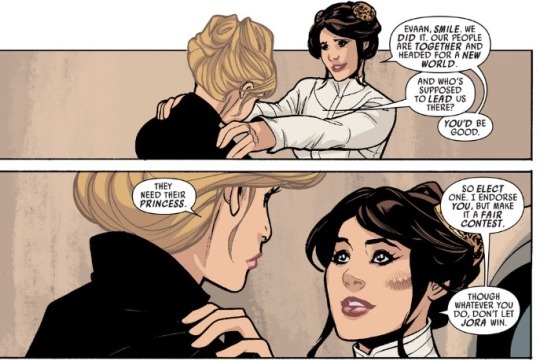 It’s simply a series of Leia showing how fantastic she is as a leader, and it would have been more interesting if the princess could have been tested at less of a superficial level. The art is fine, neither unimpressive nor necessarily the sole reason the series should be read. Part of the purpose of this series was to provide an insight into how Leia dealt with the destruction of Alderaan, and it does succeed in that respect but not an entirely satisfactory manner. Ultimately, Princess Leia is a must read for fans of Leia, not necessarily a must read for every Star Wars fan.